Industrial Blending Machine | AIM Blending Technologies, Inc.
With 28 years of experience in manufacturing industrial blending equipment, we have the knowledge and experience to make your project a success! AIM Blending Technologies, Inc. is celebrating its 28th year as a world-class leader in the manufacturing of premium quality industrial blending and processing equipment. American owned, we are an industrial equipment manufacturer that produces innovative products of superior quality and competitive pricing. We guarantee the most value for your money and timely delivery for customers in a wide range of industrial markets. For industrial processing facilities, it is important to have reliable equipment you can count on day after day to produce consistent, quality products. That is why AIM Blending puts so much time and consideration into engineering high-quality industrial blenders. At AIM Blending, we offer a wide variety of commercial processing equipment for your mixing and blending needs. Our products offer the best value in the industry, and that's a guarantee we stand behind! If you need to buy or replace a ribbon blender, the team at AIM Blending can assess your specific needs and produce a blending product that meets your specifications exactly. In addition to ribbon blenders, AIM Blending also offers a diverse selection of industrial blenders, fluidizer equipment, as well as blending operations consulting services and supporting equipment. If you're in the market for a blending machine or industrial mixers, look no further than the experts at AIM Blending. Our team ensures you have the ideal blending solution to meet your manufacturing needs. The culture at AIM Blending Technologies, Inc. focuses on customer service in all departments, offering full support before and after machine placement. Simply put, AIM Blending Technologies, Inc. offers superior quality with outstanding value. We even back that up with a written guarantee! Without exception, we offer the BEST VALUE in the industry for your blending and processing equipment investment. Our design and engineering team has actual blending plant operations experience. The team averages over 25 years each as operations, maintenance, engineers, and plant managers in large industrial blending plants. We know firsthand the problems you face, and the reliability you need. As a result, we design our equipment to be among the most reliable, safe, sanitary, and cost-effective (in regards to maintenance) you can find. It is not the cheapest equipment on the market, but its "cost of ownership" through only a few years proves it is an excellent investment for any operation. We have the experience you need. 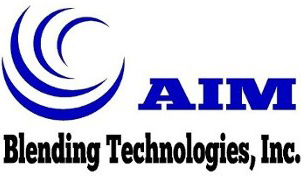 Contact AIM Blending Technologies, Inc. today for more information on our wide range of products and services. We distribute our products to customers throughout the United States, Canada, and around the world.